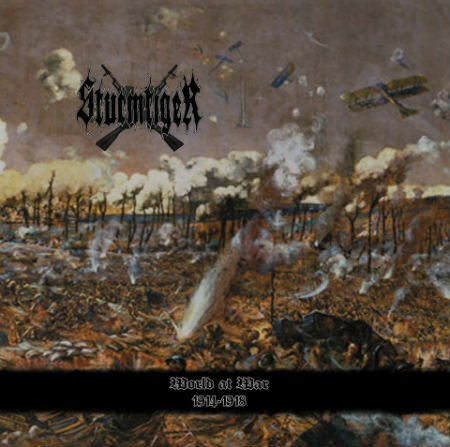 Sturmtiger have been active in the scene over a decade and previously they released some demos and EPs. Recently, they have come up with the debut full length, World at War 1914-1918 that has been released from Black Plague Records. The band was originated from Denmark and one can anticipate vigorously lethal black/death numbers from these trio. Album title provides a proper intimation to the listeners that the concept is based upon the World War I and indeed it does. Band’s moniker, Sturmtiger – which has probably been taken from the assault gun of Nazi German era, may befog one to consider the band as a NSBM. Well, their music has no resemblance with that base born NSBM; their music is purely violent and merciless black/death metal. Sound of Sturmtiger is a little bit macerated considering the sound of war metal supremacies like Blasphemy, Conqueror, Black Witchery and Morbosidad. But of course war metal elements are audible here and their sound has much more kinship with Order from Chaos, Angelcorpse etc. Some thrash metal influenced riffing and drumming are also perceivable, for example: Sodom – Obsessed by Cruelty era. The noxious war begins with the intro – The Assasination of Frang Ferdinand and further processes with the track – For your Fatherland. Well, I will acknowledge that For your Fatherland is not the proper source to evaluate the quality of the full length. Next track – Tank Attack is much more cold-blooded and the succeeding three tracks – Frontline, Trench Warfare and War Power are the climaxes of the album. Some of the tracks of the album starts with the introductory part or end with a concluding part that are historically linked to WWI. With might and main, the combination of pounding riffages and butchering drum deliveries generate a dreadful sound. Gripping solos present in the album create a different air without any doubt. These solos are ephemeral but memorable. Drummer and guitarist both should be hailed for their blazing contribution to make the album successful. Vocal hold a decent ability to metastasize the pestilence of these war hymns, but in my opinion if the volume level of the vocal output could be recorded a bit louder, then it would spawn a more fully fledged result. Two bonus tracks also appear in the album that are taken from their debut self-titled EP. These two tracks do not have the likeness with the original tracks of the album as the bonus tracks are completely black metal approach. These warriors are bearing the torch of the primitive styled black/death metal. Yet their materials are not that revolutionary to light the fire of a new torch. Despite of that, I have never found out their materials as tiresome while blasting them in my music player. Numbers like Trench Warfare, Frontline work as a stimulator to bang my head.